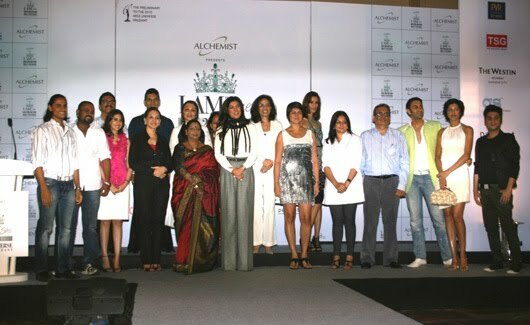 In a glittering event , the top 30 contestants for ‘I AM She 2010 – the Official Preliminary to the 2010 Miss Universe were unveiled. These talented girls were selected through a nation wide hunt in which thousands of hopefuls participated. Sushmita Sen, the soul of I AM SHE 2010 and the proud mentor for these young beauties played host to the event. Miss Asia Pacific 2000 and renowned Bollywood actor, Dia Mirza, encouraged the girls and added further excitement to the festivities. The selected 30 contestants will undergo three weeks of intensive training under the most eminent experts in communication, diet, personal grooming, fashion, fitness etc. The likes of Sathya Saran, Dr. Jamuna Pai, Lubna Adam, Bharat & Dorris, Sandip Soparrkar will guide these girls through this hard-working, disciplined yet exciting journey. The I AM She 2010 is all about celebrating uniqueness, and self. And, it has been successful in discovering our Indian women who have beauty, brains, heart and a spark of what it takes to represent the nation on a global platform like the 2010 MISS UNIVERSE Pageant.